Better With A Book: International Book Giving Day! 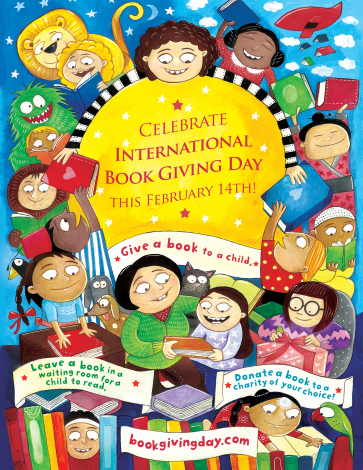 Get ready for International Book Giving Day on February 14, 2013. That's right! International Book Giving day is on Valentine's day!! This is a fun way to try to get new, used and borrowed books into the hearts and hands of as many children as possible! Apparently, several well known authors from all over the world are handing out books to children in their own special ways. Here's what you can do to participate! 1. Give a book! It's been a valentine's day tradition in our house to give books as valentine gifts for quite some time! Forget the candy and get your little ones into reading! Here is a post from the past with some of my favorite valentine books! 2. Leave a book in a waiting room or lobby! I know this sounds strange, but give it a try. Surely, you must have some great books lying around that you're willing to part with! Bring them along with you in your travels and leave them for someone else to enjoy! 3. Donate a Book! Donate a book to your local library, your school, a hospital...wherever! Have fun doing it and feel good about giving someone the gift of literacy!! How will you celebrate International Book Giving Day? Join in the conversation with the twitter handle @bookgivingday or find more information on www.bookgivingday.com! Great post. I haven't heard of this, but I love your ideas and suggestions. What a great way to encourage reading. Thanks for posting this. I hope all is well with you, have a great day!